LONDON, Sept. 14, 2018 /PRNewswire/ -- 20 cutting-edge food and agriculture startups took to the stage to present game-changing solutions for the global challenges facing food production at FoodBytes! London. Rootwave, Mimica and Biokind came out on top at the debut London event from Rabobank, as they presented to a panel of judges, corporates and investors. 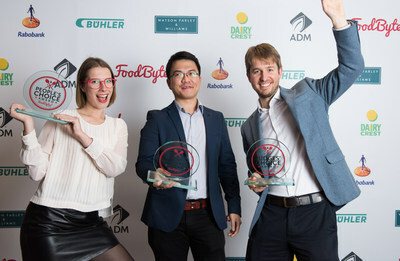 The winners were awarded the top three accolades for their products and technologies offering alternatives to herbicides, animal feed and expiry date labeling. The winners will benefit from mentorship, industry connections and a support network to take their businesses to the next level, including expert counsel from the FoodBytes! sponsors. The winners will also get to pitch at Rabobank's European Client Event in May 2019. Chosen for its pioneering use of electricity to kill weeds and offer scalable and sustainable alternatives to herbicides. Creating accessible, affordable freshness indicators for all types of perishable products, Mimica aims to become the globally recognised mark of freshness for the industry, consumers and communities. A producer of sustainable protein feed for aquaculture, livestock and pets. 3.5 minute: Connnectera, Trapview, ViroVet, Ubiqutek / Rootwave (AgTech); Mimica Lab, Easilys, SwissDeCode, TIPA (FoodTech); Yooji, Creative Nature (CPG). 1.5 minute: BeeHero, Earth Rover, EggXYt (AgTech); InnovoPro, Provenance, OddBox, SafetyNet Technologies (FoodTech); Biokind, Garcon Wines, Sea Chips (CPG). FoodBytes! London is supported by ADM, Dairy Crest, Watson Farley & Williams LLP and Bühler Group. FoodBytes! is heading to Berlin in September 2019! Sign up to our newsletter for application details. Follow on Twitter, Facebook, Instagram and LinkedIn, or via #foodbytes. FoodBytes! is a next-generation pitch competition that aims to discover the most ground-breaking food and agriculture startups and provide them the mentorship and connections they need to grow. Since launching in 2015, 210 startups have pitched on the FoodBytes! stage, 1,700+ startups have applied from 40 countries and more than 3,800 people have attended events in North America, Europe and Australia. FoodBytes! is part of Rabobank's Startup Innovation initiative and is led by a global team based in New York City and Utrecht, The Netherlands. Rabobank is a leading global food and agriculture bank, providing sector expertise, strategic counsel and tailored financial solutions to clients across the entire food value chain. Rabobank believes that sustainability and innovation are critical in promoting a thriving food and agricultural industry that will feed the increasing global population, a key focus of its Banking for Food vision to grow a better world together by 2050.